The Bankhouse can be found right in the centre of Paisley, just a 2 minute walk from Paisley Gilmour Street train station and 2 of the main bus stops in the town. Regular live music, TV coverage of sporting events, karaoke and various other special events make the Bankhouse worth a visit. 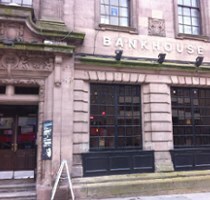 The Bankhouse is also pretty lively on Facebook so follow them to keep up with news.